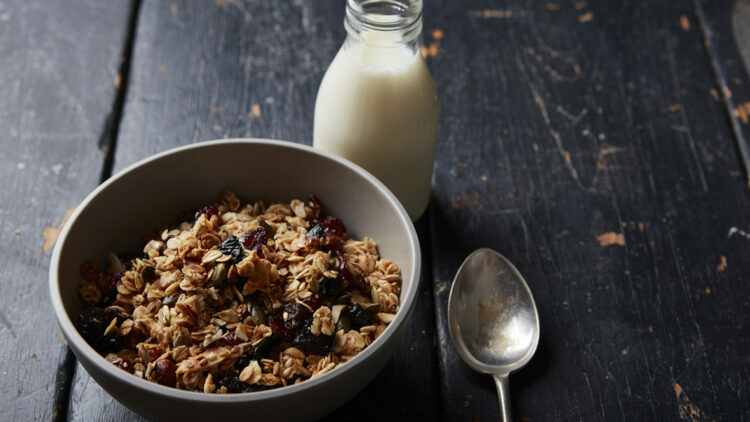 The quantities of nuts, seeds and fruit can vary according to what will make your Perfect Granola and you can replace some of the oats with another of your favourite grains like spelt flakes or oat bran. Heat the honey, coconut oil and salt until melted. Mix the dry ingredients together, apart from the fruit, and coat well in the honey mix. Bake at 150oC for around 25 minutes until golden. Mix the fruit through and allow to cool before storing in an airtight container. Serve with milk or yoghurt in the morning or as a topping for fruit as a guilt free dessert.